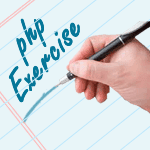 Write a PHP script that creates the following table using for loops. Add cellpadding="3px" and cellspacing="0px" to the table tag. Previous: Write a program which will count the "r" characters in the text "w3resource". Next: Write a PHP script using nested for loop that creates a chess board as shown below.